Pre-measured admixture pack designed to be combined with most standard concrete bag mixes and water. One admixture pack combined with either an 80 lb. bag or a 60 lb. 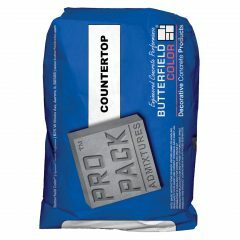 bag of standard concrete mix will convert most economical concrete bag mixes into high performance concrete countertop mix. Increases strength, reduces shrinkage, improves finishing characteristics, accelerates set time and allows decreased water cement ratio. The mix may be colored with Butterfield Color® Uni-Mix® Color Packs (2 color packs per unit are required), 24 Standard colors are available. Mixes containing Pro Pack® Countertop Admixture may be stained by applying Perma-Cast® Sierra Stain™ or Elements® Transparent Concrete Stain.